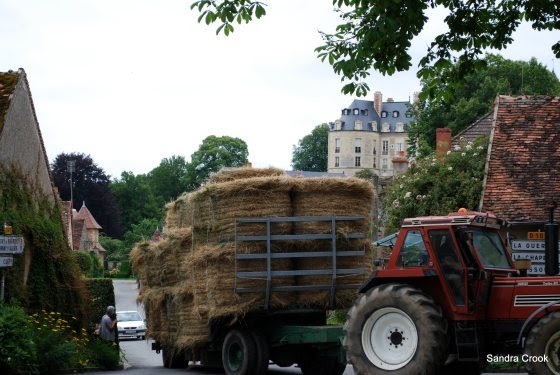 Village life in France…this photo makes me want to be there now. This story may be the predecessor of last week’s tale of reprisal. The smell of hay brought it all back. Summers spent on the farm, the warm afternoons in the hayloft, their sighs disturbing only the mice. Smiling, she shook her head at the memory; at their folly, his hay fever, the sneezing. Stepping up the pace to reach to pharmacy, she didn’t want to keep her husband waiting. His allergies were bothering him this week. Eyes red-rimmed and weepy, he cursed the hay truck as it passed. “Damn hay – gets me every time” he said, sneezing loudly again. Suddenly, she knew where he’d been that afternoon. Suddenly, she knew. Oh snap! Hope she gets back at him! Maybe a pillow made of hay? Seems an odd place for him to be when he knows what it does to him. Rumbled! Nice take on the prompt Erin, now what’s she going to do about it? I like the hay-filled pillow suggestion. I’m thinking she’s much more sinister than that. I plan to take a note from your page and do him in. Thank you, Janet. No matter what Helena says about you, your comments are spot on. I think he’s going to end up inside a bale at this rate. True, that title would work. I thought the double play of hay fever (ailment) and hay fever (hot in the hay) was the way to go. But I’m nothing if not flexible. Now to sell tickets to you and Janet’s throw down – May the best woman win! I’m laughing because if Erin wouldn’t have said anything, I wouldn’t have know I’d been so grossly insulted. I like “Hay Fever” because he obviously thought he was hot (and so did at least one other someone) and it worked in the literal sense, too. You threw down the gauntlet, Helena, but I’m laughing too hard to fight. Maybe another day. I figured I had to fan the fire – a little late but always worth a try! Our snow must have put it out. I am now stepping aside to watch the show…. Maybe he was with the Scarecrow from the Wizard of Oz? Just trying to look on the bright side. Good story and words used for good effect to paint a word picture. He’s not only allergic, he’s not too bright. Yes, exactly. Seems a little self absorbed. Yes – it suddenly becomes clear and not always for the better. Sad. Will they survive together? I am predicting they are on their last legs…. Men sometimes don’t think it all through…. I’d recommend that she switch out those allergy pills with placebos. 🙂 Nicely written, Erin. I enjoy your work. That’s where my head went, too…. I love the layering and subtlety of your story. Applause! Thank you. This was one of those stories that wrote itself as I went along. I thought she was out for a pleasant stroll but turns out I was wrong. Oh stupid husband! He’s so going to get it now. Love this take on the prompt. If you read this week’s story along with last week’s, that may be how it ends up…. Damn, he should have kept his mouth shut if he knew what was good for him. Excellent transition from innocent memories to the revealing of a betrayal! Betrayed by a sneeze. He will get what he deserves. Oh-oh. I like this. Very nicely done. Love, betrayal, and the wheels of vengeance turning all in 98 little words. You go, girl! Oh now, let’s not jump to conclusions. I’m sure he has a reasonable explanation. This is only circumstancial evidence, and pretty slim at that 🙂 Or is this the straw that broke her back?